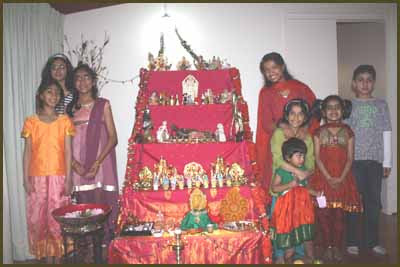 'In South India, a doll festival or the "Golu" festival marks Navrathri. This nine day festival is celebrated in various manners in different parts of the country. This is much similar to the Hina Matsuri festival of Japan, celebrated every year on March 3rd, often called the Girl's Festival.' Then again, the display of dolls with themes, remind one of the Janmashtami displays.
. . . This doll festival has many features similar to that of Japan. The dolls are usually handed down from mother to daughter, often the dolls on display being family heirlooms handed down over generations. It is also a doll festival exclusively by the women. We have just celebrated Navratri, or the Festival of Nine Nights. Saraswati (the Goddess of Knowledge and Learning). In different parts of India, this festival is celebrated differently. In Gujarat they dance the stick-dance (dandiya) all night long, the sticks symbolizing the sword with which the goddess Durga struck down the evil demon. But in my state of Karnataka, we worship our goddesses by making doll displays of them. In Kannada, we call this Bombe Habba. ***** . Hina Doll Festival (hina matsuri 雛祭り) .